The Dow Jones Industrial Average has fallen today, but Microsoft is up as it prepares to expand its product line. The Dow Jones Industrial Average (DJINDICES:^DJI) slipped 0.32% late in trading today as investors came back from the Independence Day holiday. There wasn't any significant economic news today, but last week ended with a Labor Department report that showed 288,000 jobs created in June, another sign that the economy is picking up steam. Economists and the Federal Reserve predict that U.S. economic activity will return to growth in the second quarter, following the first quarter's 2.9% drop. If it does, the optimism the market is displaying by regularly hitting new highs will be validated. One of only a handful of companies moving higher as trading wound down today is Microsoft (NASDAQ:MSFT), which was up 0.4%. Investors have their eyes on a few products that would continue the company's transformation from strictly software to devices. Microsoft is trying to make the look of its start screen more uniform across its products. The first notable product is the Xbox One's Kinect sensor, which will soon work with Windows. The sensor is set to ship July 15 and will include a wider field of view; developers will also be able to create apps for the device through the Windows Store. It'll take time to see if the device is a success, but at least Microsoft is pushing the envelop of its offerings and doing more to integrate its wide range of products. Potentially more important is speculation that a smaller version of the Surface tablet is back in production. Microsoft earlier this year revealed a larger 12-inch Surface Pro 3 that is intended as more of a laptop replacement than most tablets. But there's still a hole in the product line where a smaller tablet could go, and that product is reportedly coming later this summer. Microsoft has faced significant criticism in recent years because it hasn't been as nimble to new markets as rivals like Apple, which invented entirely new markets. However, from an investment perspective Microsoft has still done extremely well. 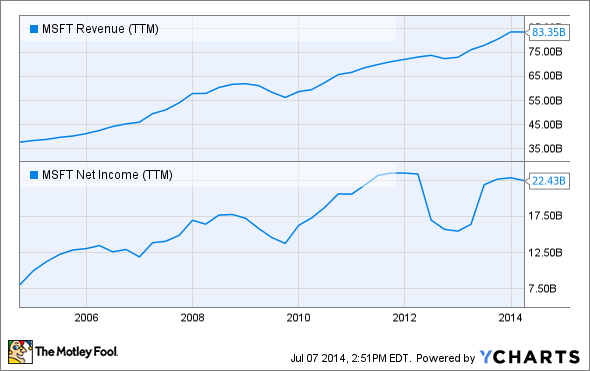 You can see below that over the past decade revenue is up 120% and net income is up nearly 180%. As Microsoft rolls out new cloud features, further integrates its enterprise software, and gains a larger share in smartphones and tablets, the company should remain a tech powerhouse. Few companies can build the scale Microsoft has in tech, and that scale will be extremely important as devices and connectivity increase in the future.